Nationwide Industries Non-Sag Gate Kits for Wood Gates | Hoover Fence Co.
Non-sag gate kits are commonly used on wood gates. 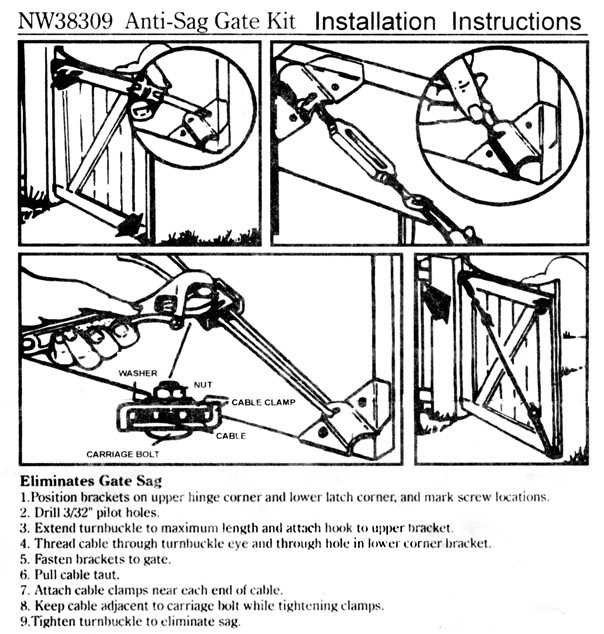 Install kit during new construction or add to existing gate to correct dragging or sagging gates. Kit includes (2) corner brackets, truss cable, turnbuckle, and screws. Kits feature a rust resistant zinc finish. Don't forget the hinges and latch for your gate! This kit is designed for use with wood materials. Includes Everything Needed For Mounting. Cable measures 90" Long (7-1/2'). Truss cables/ wires are installed diagonally on the structural members of the gate, i.e. the frame. When a device is used to 'pull', such as this one, install the truss cable on the top of the gate upright (hinge side) and run the cable down to the opposite side, bottom of latch side of frame. When diagonal braces are installed, such as a 2 x 4 or 1 x 4 into the frame, do so in reverse. This 'pushes' up on the latch side of the gate frame. Theoretically, either method will keep the gate square. Position brackets on upper hinge corner and lower latch corner and mark screw locations. Drill pilot holes. This may be unnecessary for softer woods such as cedar. Extend turnbuckle to maximum length and attach hook to upper bracket. Thread cable through turnbuckle eye and through hole in lower corner bracket. Attached cable clamps near each end of cable. Keep cable adjacent to carriage bolt while tightening clamps. Tighten turnbuckle to eliminate sage. Coloque los soportes en la esquina superior de la bisagra y en la esquiona inferior del pestillo y marque la ubicacion de los tornillos. Extienda el tensor a su maxima extension y suete et gancho al sorporte superior. Pase el cable a tuaves del ojo del tensor y taves del orilicio del soporte de la esquina inferior. Sujele los soportes al porton. Sujete las abrazaderas del cable cerca de cada extremo del cable. Mantenga el cable adadyacente a los lornillos de caruaje al apretar las abrazaderas. Apriete el tensor para eliminar el descuadre.